LONDON, Nov. 7, 2018 /PRNewswire/ -- Delphi Technologies PLC (NYSE: DLPH) ("Delphi Technologies" or the "Company"), a global leader in vehicle propulsion, today reported third quarter 2018 U.S. GAAP earnings of $0.44 per diluted share. Excluding special items, third quarter earnings totaled $0.72 per diluted share. The Company also reported revenue of $1.2 billion for the quarter and $3.7 billion for the year-to-date period, a decrease of 1% and an increase of 2% compared to the respective equivalent prior period, on an adjusted basis. Prior to December 4, 2017, Delphi Technologies operated as the Powertrain Systems segment of Delphi Automotive PLC (the "former parent") and the historical financial information presented in this press release for periods prior to December 4, 2017 were derived from the former parent's accounting records and are presented on a carve-out basis as if Delphi Technologies had operated as a stand-alone company for all periods presented. "While we face a more challenging external environment, particularly in China, we delivered above market revenue growth in Q3 and remain in a strong position to unlock long-term value. Our confidence is driven by an acceleration in momentum in key areas of our portfolio which strengthens our future prospects. For example, our industry leading Power Electronics technology has seen adjusted revenue growth of approximately 50% in 2018. 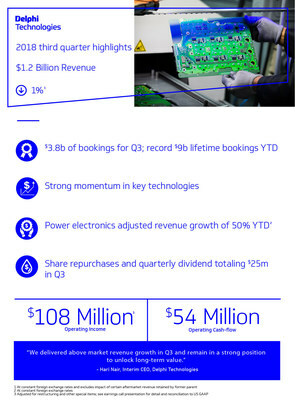 Moreover, with a record $9 billion of lifetime bookings in the first three quarters of the year, we have already exceeded our internal target for 2018, and we continue to make significant investments to support this growth," said Hari Nair, interim Chief Executive Officer of Delphi Technologies. "While we expect certain transitional headwinds to continue into 2019, we will further prioritize our investments in our industry-leading technologies on the path to electrification, and ultimately drive stronger long-term growth." The Company reported third quarter 2018 revenue of $1.2 billion, a decrease of 4% from the prior year period. Adjusted for currency exchange and certain aftermarket original equipment service revenue retained by the former parent, revenue decreased by 1% in the third quarter. Adjusted revenue reflects a decrease of 2% in Powertrain Systems and a decrease of 1% in Delphi Technologies Aftermarket. On a regional basis, adjusted revenue also reflects growth of 5% in Europe, 3% in North America, 15% in South America and a decrease of 13% in Asia. The Company reported third quarter 2018 U.S. GAAP net income of $39 million and net income of $0.44 per diluted share, compared to $78 million and $0.88 per diluted share in the prior year period. Third quarter Adjusted Net Income, a non-GAAP financial measure defined below, totaled $64 million, or $0.72 per diluted share, which compares to Adjusted Net Income in the prior year period of $111 million, or $1.25 per diluted share. The decrease in Adjusted Net Income per Share was primarily due to unfavorable product mix, interest expense related to the issuance of debt in 2017 and, to a lesser degree, spin-related costs associated with becoming a stand-alone public company. Third quarter U.S. GAAP operating income was $81 million, compared to $113 million in the prior year period. Adjusted Operating Income, a non-GAAP financial measure defined below, was $108 million, compared to $147 million in the prior year period. Adjusted Operating Income margin in the third quarter of 2018 was 9.3%, compared to 12.2% in the prior year period. The decrease in Adjusted Operating Income was primarily related to an unfavorable product mix and, to a lesser degree, spin-related costs associated with becoming a stand-alone public company. Depreciation and amortization expense (including asset impairment charges) totaled $47 million in the third quarter as compared to $47 million in the prior year period. Interest expense for the third quarter totaled $20 million, as compared to $1 million interest expense the prior year period, which reflects the interest related to the issuance of $1,550 million of debt during 2017 in connection with the separation. U.S. GAAP tax expense in the third quarter of 2018 was $12 million, resulting in an effective tax rate of approximately 22%, compared to $26 million, or an effective rate of 23%, in the prior year period. The decrease in the effective tax rate reflects the impacts of favorable changes in geographic income mix. The Company generated net cash flow from operating activities of $54 million in the third quarter, compared to $117 million in the prior year period. The decrease in operating cash flow is primarily due to the decrease in net income as well as net working capital related cash outflows. Capital expenditures totaled $62 million in the third quarter, compared to $29 million in the prior year period. The increased spending is primarily due to investments to support becoming a stand-alone public company and long-term growth in key technologies. For the nine months ended September 30, 2018, the Company reported revenue of $3.7 billion an increase of 4% from the prior year period. Adjusted for currency exchange and certain aftermarket original equipment service revenue retained by the former parent, revenue increased by 2% during the period. Adjusted revenue reflects revenue growth of 1% in Powertrain Systems and decrease of less than 1% in Delphi Technologies Aftermarket. On a regional basis, adjusted revenue also reflects growth of 4% in North America, 2% in Europe, 9% in South America and a decrease of 3% in Asia Pacific. For the 2018 year-to-date period, the Company reported 2018 U.S. GAAP net income of $223 million and net income of $2.51 per diluted share, compared to $229 million and $2.58 per diluted share in the prior year period. Year-to-date Adjusted Net Income, a non-GAAP financial measure defined below, totaled $295 million, or $3.32 per diluted share, which compares to Adjusted Net Income in the prior year period of $347 million, or $3.92 per diluted share. The decrease in Adjusted Net Income per Share was primarily due to unfavorable product mix, interest expense related to the issuance of debt in 2017 and, to a lesser degree, spin-related costs associated with becoming a stand-alone public company. The Company reported U.S. GAAP operating income of $341 million for the nine months ended September 30, 2018, compared to $340 million in the prior year period. Adjusted Operating Income, a non-GAAP financial measure defined below, was $423 million for the nine months ended September 30, 2018, compared to $473 million in the prior year period. Adjusted Operating Income margin was 11.5% for the nine months ended September 30, 2018, compared to 13.3% in the prior year period. The decrease in Adjusted Operating Income was mainly due to an unfavorable product mix, spin-related costs associated with becoming a stand-alone public company, and the absence of a commercial settlement that benefited the first quarter of 2017. Depreciation and amortization expense (including asset impairment charges) totaled $145 million as compared to $144 million in the prior year period. Interest expense for the nine months ended September 30, 2018 totaled $59 million, as compared to $2 million in the prior year period, which reflects the interest related to the issuance of $1,550 million of debt during 2017 in connection with the separation. U.S. GAAP tax expense for the nine months ended September 30, 2018 was $54 million, resulting in an effective tax rate of approximately 19%, compared to $79 million, or an effective rate of 24%, in the prior year period. The decrease in the effective tax rate reflects the impacts of favorable changes in geographic income mix and a decrease in net discrete tax expense. The Company generated net cash flow from operating activities of $293 million in the nine months ended September 30, 2018, compared to $293 million in the prior year period, which reflects improvement in net working capital, partially offset by lower restructuring expense and the decrease in net income. Capital expenditures totaled $185 million during the nine months ended September 30, 2018, compared to $111 million in the prior year period. The increased spending is primarily due to investments to support becoming a stand-alone public company and long-term growth in key technologies. Reconciliations of Adjusted Net Income, Adjusted Net Income per Share and Adjusted Operating Income, which are non-GAAP measures, to the most directly comparable financial measures calculated and presented in accordance with accounting principles generally accepted in the United States ("U.S. GAAP") are provided in the attached supplemental schedules. In line with its October 5th update, the Company has maintained its full year outlook for 2018 as it relates to Adjusted revenue growth and Adjusted Operating Income margin. Revenue is expected to be in the range of $4.85 - $4.90 billion. Adjusted Operating Income margin is expected to be in the range of 11.3% - 11.5%. Adjusted earnings per share is now expected to be in the range of $4.20 - $4.30. The Company has also provided a selected preliminary full year outlook for 2019. Adjusted revenue growth is expected to be in the range of approximately 1% to 2% and Adjusted Operating Income margin is expected to be in the range of approximately 9% to 10%, attributable to the impact of product mix and incremental investments to support strong bookings momentum. Capital expenditures are expected to be approximately 7% of revenue. Free Cash Flow is expected to be approximately break-even. The Company plans to provide further details in conjunction with its fourth quarter and full year 2018 earnings release. The Company will host a conference call to discuss these results at 8:30 a.m. (ET) / 1:30 p.m. (GMT) today, which is accessible by dialing 866.761.8621 (US domestic) or 703.925.2612 (international) or through a webcast at http://ir.delphi.com. The conference ID number is 5458629. A slide presentation will accompany the prepared remarks and has been posted on the investor relations section of the Company's website. A replay will be available two hours following the conference call. Delphi Technologies is a technology company focused on providing electric vehicle and internal combustion engine propulsion solutions, in addition to solving emissions and fuel economy challenges for the world's leading automotive OEMs. Delphi Technologies also provides leading aftermarket service solutions for the replacement market. With headquarters in London, U.K., Delphi Technologies operates technical centers, manufacturing sites and customer support services in 24 countries. Visit delphi.com. This press release contains information about Delphi Technologies' financial results which are not presented in accordance with U.S. GAAP. Specifically, Adjusted Operating Income, Adjusted Net Income, Adjusted Net Income per Share and Free Cash Flow are non-GAAP financial measures. Adjusted Operating Income represents net income before interest expense, other income (expense), net, income tax expense, equity income (loss), net of tax, restructuring, separation costs and asset impairments. Adjusted Operating Income margin is defined as Adjusted Operating Income as a percentage of Net sales. Adjusted Net Income represents net income attributable to Delphi Technologies before restructuring and other special items, including the tax impact thereon. Adjusted Net Income per Share represents Adjusted Net Income divided by the weighted average number of diluted shares outstanding for the period. Free Cash Flow represents operating cash flows less capital expenditures. Management believes the non-GAAP financial measures used in this press release are useful to both management and investors in their analysis of the Company's financial position, results of operations and liquidity. In particular, management believes Adjusted Operating Income, Adjusted Net Income and Adjusted Net Income per Share are useful measures in assessing the Company's ongoing financial performance that, when reconciled to the corresponding U.S. GAAP measure, provide improved comparability between periods through the exclusion of certain items that management believes are not indicative of the Company's core operating performance and that may obscure underlying business results and trends. Management also uses these non-GAAP financial measures for internal planning and forecasting purposes. Such non-GAAP financial measures are reconciled to the most directly comparable U.S. GAAP financial measures in the attached supplemental schedules at the end of this press release. Non-GAAP measures should not be considered in isolation or as a substitute for the Company's reported results prepared in accordance with U.S. GAAP and, as calculated, may not be comparable to other similarly titled measures of other companies. The Company is unable to reconcile the preliminary 2019 forward-looking non-GAAP financial measures presented above to their nearest U.S. GAAP measures without unreasonable efforts because of the difficulty in predicting with a reasonable degree of certainty the restructuring, separation and other unusual expenses it may incur, or the unusual benefits it may realize, from time to time. These items could have a significant impact on the Company's U.S. GAAP results. This press release, as well as other statements made by Delphi Technologies PLC, contain forward-looking statements that reflect, when made, the Company's current views with respect to future events and financial performance and, in particular, the Company's 2018 and 2019 outlook. Such forward-looking statements are subject to many risks, uncertainties and factors relating to the Company's operations and business environment, which may cause the actual results of the Company to be materially different from any future results. In particular, the 2019 outlook included herein is based on the Company's preliminary indications regarding 2019 and is subject to revision when the Company provides its 2019 outlook in connection with the announcement of fourth quarter results. All statements that address future operating, financial or business performance or the Company's strategies or expectations are forward-looking statements. In some cases, you can identify these statements by forward-looking words such as "may," "might," "will," "should," "expects," "plans," "intends," "anticipates," "believes," "estimates," "predicts," "projects," "potential," "outlook" or "continue," the negatives thereof and other comparable terminology. Factors that could cause actual results to differ materially from these forward-looking statements include, but are not limited to, the following: global and regional economic conditions, including conditions affecting the credit market and those resulting from the United Kingdom referendum held on June 23, 2016 in which voters approved an exit from the European Union, commonly referred to as "Brexit"; risks inherent in operating as a global company, such as, fluctuations in interest rates and foreign currency exchange rates and economic, political and trade conditions around the world; the cyclical nature of automotive sales and production; the potential disruptions in the supply of and changes in the competitive environment for raw material integral to the Company's products; the Company's ability to maintain contracts that are critical to its operations; potential changes to beneficial free trade laws and regulations such as the North American Free Trade Agreement; the ability of the Company to achieve the intended benefits from its separation from its former parent or from acquisitions the Company may make; the ability of the Company to attract, motivate and/or retain key executives; the ability of the Company to avoid or continue to operate during a strike, or partial work stoppage or slow down by any of its unionized employees or those of its principal customers; the ability of the Company to attract and retain customers; changes in the costs of raw materials; the Company's indebtedness, including the amount thereof and capital availability and cost; the cost and outcome of any claims, legal proceedings or investigations; the failure or breach of information technology systems; severe weather conditions and natural disasters and any resultant disruptions on the supply or production of goods or services or customer demands; acts of war and/or terrorism, as well as the impact of actions taken by governments as a result of further acts or threats of terrorism; and the timing and occurrence (or non-occurrence) of other events or circumstances that may be beyond the Company's control. (1) Eliminations and Other includes the elimination of inter-segment transactions. In this press release the Company has provided information regarding certain non-GAAP financial measures, including "Adjusted Operating Income," "Adjusted Net Income" and "Adjusted Net Income per Share." Such non-GAAP financial measures are reconciled to their closest U.S. GAAP financial measure in the following schedules. Adjusted Operating Income : Adjusted Operating Income is presented as a supplemental measure of the Company's financial performance which management believes is useful to investors in assessing the Company's ongoing financial performance that, when reconciled to the corresponding U.S. GAAP measure, provides improved comparability between periods through the exclusion of certain items that management believes are not indicative of the Company's core operating performance and which may obscure underlying business results and trends. Management utilizes Adjusted Operating Income in its financial decision making process, to evaluate performance of the Company and for internal reporting, planning and forecasting purposes. Management also utilizes Adjusted Operating Income as the key performance measure of segment income or loss and for planning and forecasting purposes to allocate resources to the Company's segments, as management also believes this measure is most reflective of the operational profitability or loss of the operating segments. Adjusted Operating Income is defined as net income before interest expense, other income (expense), net, income tax expense, equity income (loss), net of tax, restructuring, separation costs and asset impairments. Not all companies use identical calculations of Adjusted Operating Income, therefore this presentation may not be comparable to other similarly titled measures of other companies. The Company's 2018 and 2019 guidance was determined using a consistent manner and methodology. subsequent to December 4, 2017, these costs include one-time incremental expenses associated with becoming a stand-alone publicly-traded company. Adjusted Net Income and Adjusted Net Income per Share : Adjusted Net Income and Adjusted Net Income per Share, which are non-GAAP measures, are presented as supplemental measures of the Company's financial performance which management believes are useful to investors in assessing the Company's ongoing financial performance that, when reconciled to the corresponding U.S. GAAP measure, provide improved comparability between periods through the exclusion of certain items that management believes are not indicative of the Company's core operating performance and which may obscure underlying business results and trends. Management utilizes Adjusted Net Income and Adjusted Net Income per Share in its financial decision making process, to evaluate performance of the Company and for internal reporting, planning and forecasting purposes. Adjusted Net Income is defined as net income attributable to Delphi Technologies before restructuring and other special items, including the tax impact thereon. Adjusted Net Income per Share is defined as Adjusted Net Income divided by the weighted average number of diluted shares outstanding for the period. Not all companies use identical calculations of Adjusted Net Income and Adjusted Net Income per Share, therefore this presentation may not be comparable to other similarly titled measures of other companies. The Company's 2018 and 2019 guidance was determined using a consistent manner and methodology. Prior to December 4, 2017 separation costs include one-time expenses related to the separation from the Company's former parent. For periods subsequent to December 4, 2017, these costs include one-time incremental expenses associated with becoming a stand-alone publicly-traded company. Represents an adjustment to income tax expense related to changes in tax law recognized at the date of enactment and adjustments to provisional amounts recorded in 2017 related to the U.S. Tax Cuts and Jobs Act. Represents the income tax impacts of the adjustments made for restructuring and other special items by calculating the income tax impact of these items using the appropriate tax rate for the jurisdiction where the charges were incurred.